Three years ago, ARNABirth was celebrated amidst the hubbub of Durga Puja in Kolkata. I feasted on a sumptuous dinner of hilsa fish and rice at Oh, Calcutta. The upscale restaurant is located in the Forum shopping complex and serves authentic Bengali cuisine. Coincidentally, my travel companion was also born on the same day, so we paid for each other's portion of the feast. Two years ago, I had returned to the fair city of Vancouver. The Shaolin Warriors were in town as well. I was awed by the superbly choreographed blend of kung fu and dance moves demonstrated by the troupe of traveling monks from China. Around 500 AD, a Buddhist monk had journeyed from India to China and established the Shaolin monastery. Discipline, spirituality, and martial arts expertise were united to form the Shaolin Warriors - the legendary masters of kung fu. Particularly popular was the artistry displayed by the miniature monks. The child performers impressed with their dexterity and high level of skill. This year, the celebrations spanned several days. The global television audience trailed the World Cup and the Olympics, but family, friends, and coworkers all joined in on the fun. A BC Lions game, my first hot pot experience, and dinner at the Cloud 9 revolving restaurant were some of the mentionable highlights. One of my favourite books is The Namesake, written by Jhumpa Lahiri. The Boston-based Bengali author tells the quintessential tale of a young man born and raised in the West to Indian parents. A Bengali man has an arranged marriage and then brings his new wife to North America. They build a life together and start a family. The son is caught between two cultures, struggling to define his identity. The father is a heart attack prone university professor and the mother is a lonely housewife. The novel was adapted into a film by Mira Nair and starred Kal Penn as the title character. My namesake, Arnab Sen , worked as an art department trainee for the movie. I was taking an innocent lunchtime stroll in downtown Vancouver. Around the intersection of West Pender St and Homer St, a woman's voice yelled out "Stop!". Unaccustomed to hearing this phrase uttered outdoors, I came to an abrupt halt. The voice belonged to a women who was directing foot traffic on the sidewalk I was on. She said they were filming a show called Samurai Girl, and I would have to wait before I could cross. She conferred with someone on her walkie talkie before waving me through, sternly warning me not to look at what was being filmed in the alleyway that I was crossing. I only took a quick glimpse, failing to spot Samurai Girl in action. 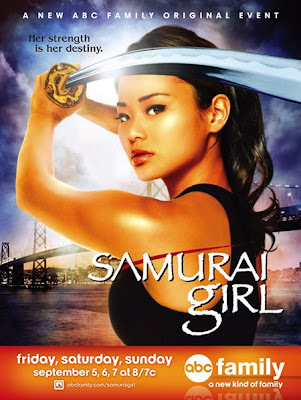 Samurai Girl is a six part mini-series event that premiered on ABC Family channel. It is the tale of a teenage girl whose family is brutally attacked at her wedding. She trains to become a ninja so that she can find out who is responsible for the crimes and bring them to justice. The most famous comedian to emerge out of Canada in recent years is Russell Peters. The Indo-Canadian comic focuses his talents on generating racial and rude humour, hilariously mimicing the accents of people from different nationalities. Russell Peters is often criticized for reusing material. Most of his fans have only come to this realization after repeatedly watching all his performances on YouTube. On his first tour to India, the first by any North American comic, he visited Bangalore. A mixed group of Bangalore's nouveau elite and foreigners were in attendance. He performed to a full house at Chowdiah Memorial Hall, an auditorium that was constructed in the shape of a violin. Back in Vancouver, after enjoying a hearty meal at Hamburger Mary's Diner, I went to the Jupiter Lounge for another night of rib tickling laughs. The meal at the seventies style diner consisted of a mish mash of free Range Canadian bison, venison, and musk ox (the Arctic burger) and a chocolate milkshake. The Comedy Night for Diabetes was an event to support the Canadian Diabetes Association. Four comedians were scheduled to perform in the fundraiser but one did not show. A stand up stand in was quickly located and performed adequately considering he had no preparation. The roster included host Paul Breau, Seth Perry, the hyperactive headliner Simon King, and an unknown comedian. On the banks of the river Seine over 60,000 square metres of prime Paris real estate is occupied by the finest museum I have been to. As I am a man among men, the Louvre is a museum among museums. Opened in 1793, the Louvre hosts a massive collection of artifacts, paintings, and sculptures. Six million visitors a year wander its wings after entering through the glass pyramid entrance and descending into the underground lobby. Tickets can be purchased from vending machines. A useful map of the grounds that highlights the premier attractions such as the Mona Lisa, Winged Victory, and Venus de Milo is also available. With treasures from all corners of the world on display, it was an easy mistake for many tourists to make when they assumed that I was one of the specimens in the Louvre's collection and started snapping pictures. The collection was so extensive that my entire day was spent at the museum, including lunch at the Louvre cafeteria. Several tourists took ill with cases of museum fatigue and had to be removed from the premises. The Musee du Louvre was formerly a fortress constructed in the 12th century. Three wings, Sully, Denon, and Richelieu, frame the central courtyard and the recently constructed pyramid. There is also a smaller inverted pyramid and an underground mall attached to the Louvre that I stumbled upon. The eight curatorial departments are (1) Egyptian Antiquities, (2) Near Eastern Antiquities, (3) Greek, Etruscan, and Roman Antiquities, (4) Islamic Art, (5) Sculpture, (6) Decorative Arts, (7) Paintings, and (8) Prints and Drawings. Room after room, corridor after corridor, new spectacles await. On Thanksgiving weekend the Vancouver Whitecaps Football Club faced the Puerto Rico Islanders in the USL First Division final. Although the Islanders were the higher ranked team based on regular season standings, the Whitecaps had been controversially chosen to host the final due to a more favourable bid. The pre-game ceremonies followed the traditional FIFA format, with both teams being accompanied by miniature soccer players as they came on to the field. After a scoreless first half, Vancouver took the lead early in the second before Puerto Rico equalized. Four minutes later the Whitecaps again took the lead off a header. They held on for the remaining few minutes, capturing their second USL title in 3 years but the first on home soil. As the world's most popular sport soccer appeals to the lowest common denominator. There were no hooligans present at this game, only 5800 well behaved fans. After the final whistle blew, a slow and steady stream of ardent supporters (the "Westside Rowdies") ran onto the field. Eventually all the fans that were not sitting in the grandstand area congregated on the soccer ground as the Whitecaps accepted the championship trophy in front of them. There was much singing and merriment as one by one the players took their turn hoisting the trophy. Because Whitecaps, Whitecaps is our name! The theme is poverty for this year's edition of Blog Action Day. Poverty can seem like an overwhelmingly huge issue to tackle, so I will focus on a particular aspect only. The inability to read is often times a significant barrier for low income individuals, severely restricting their career options. Being able to read allows for digestion and understanding of a broad range of subjects. Whether used for education, entertainment, or self-sufficiency, reading is a skill that once learned becomes used in almost every aspect of daily life. The Raise-a-Reader program was first introduced in Vancouver in 2002, and has since spread to almost 30 communities across Canada. Volunteers sell newspapers on Raise-a-Reader day, with all the proceeds going to local literacy programs. The Vancouver Canucks and its players have always been strong supporters of the program, so I was not surprised to see legendary Canuck Stan Smyl selling papers at a street corner on this year's Raise-a-Reader day. I was impressed though by the the range of people who were engaged in the noble undertaking. People from all strata of society were involved, from celebrities to firefighters to school children. Block after block, each street corner in the downtown core was occupied by a group of newspaper toting volunteers in an impressive display of people uniting for the common good. I gave a generous contribution to a particularly enthusiastic volunteer, who handed me my special edition copy of the Vancouver Sun and applied a "I helped Raise-a-Reader today!" sticker to my bosom. 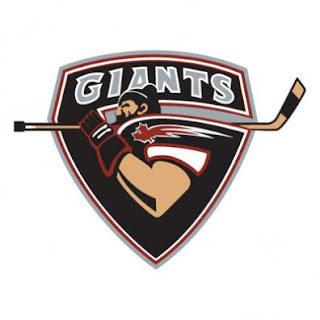 The Vancouver Giants were victorious against the Spokane Chiefs in what turned out to be the last home game of the 2007-2008 Canadian Hockey League (CHL) season for them. I met a friend of mine at Pacific Coliseum, the former home of the Vancouver Canucks and current home of Vancouver's junior hockey franchise since it was founded in 2001. Unlike their NHL counterparts, Giants tickets were inexpensive and easily obtained on game day minutes before the puck dropped. The action was fast paced and exciting, with a lot of the chances being generated by youthful mistakes by players on both sides. We sat in the upper bowl. Directly behind us were a group of women who heartily debated which spa was the best in town. The heated exchange spanned multiple periods but their was no winner. Spa Utopia and Spa Ethos emerged as the two top contenders though. The Giants were eliminated from playoff contention in the following game of the best-of-7 Western Conference semi-finals. The Chiefs went on to win the WHL Championship, which Vancouver had captured two years earlier. In a strange twist, they had lost in the WHL Championship Finals last year before going on to host and win the more prestigious Memorial Cup. The Memorial Cup pits the host city versus the champions of the three major junior Canadian hockey leagues - the Western Hockey League (WHL), the Ontario Hockey League (OHL), and the Quebec Major Junior Hockey League (QMJHL). A critic of my lackluster efforts to secure an ARNABride once pointed out that I must be doing something seriously wrong if I could not locate half of the earthly population. I have identified that part of the problem is that I am not where they are. For instance I am working in the IT industry, which is rarely graced by a woman's beauty. Not only are ladies avoiding my vocational area en masse, they are also vacating my geographical region in large numbers. When I went to the Go Abroad Fair held at the Canada Place convention centre I was surprised to see such a high quantity of beauties looking to head oversees. The fair maidens were fleeing to places both exotic and mundane, but all to locations I would not be present in. From teaching in Korea or Japan to studying in Europe or Australia to volunteering in Africa, a world of opportunities was open to them. I could not begrudge them their chance to go beyond borders. Crossing cultures is becoming more and more common in the global economy. Although I have not volunteered or studied overseas, I have worked internationally. My yearlong stint with Satyam in India was an eye opening experience, and not just from a career enhancing aspect. I was able to live and work alongside people from all corners of the globe, resulting in a highly rewarding voyage of discovery. Surrey is the second largest city in BC and one of the fastest growing communities in the nation. A high percentage of the population inflow is made up of new immigrants to Canada, with quite a few coming from the Indian subcontinent. When Surrey decided to have a festival to celebrate its multicultural makeup, particular attention was paid to this community. In a brilliant move by the city of Surrey, both the Prince of Honour and the crown prince of bhangra headlined the first day of festivities. Bhangra, a dance form that originated in the Indian state of Punjab, has gained immense popularity worldwide for its energetic style and accompanying music beats. Holland Park, located just across the street from the Central City complex, was the site of the first Fusion Festival. Music and food from around the world were enjoyed by the public. I had some venison purchased from a First Nations food stall and then wandered over to the main stage to watch KS Makhan perform. After he left, the crowd waited in anticipation for Surrey's own Jazzy B to arrive. After entering to much fanfare, the bhangra superstar kept up the pace throughout the night, demonstrating some slick dance moves in the process. Rows of chairs had been set up in front of the stage and this prime real estate was occupied by children and the elderly. The mass of humanity that had been standing on the edges of the seating area far outnumbered those with seats. They started to slowly creep forward. Sensing that the show was nearing its end, the pace of encroachment increased. Soon enough, the sitters had all vacated the area near the stage and the rest of the crowd closed in. The tempo and the number of rhythmically moving hands in the air increased dramatically as the night drew to a deafeningly loud close. Ypres is a historic town in West Flanders, Belgium. The site of several significant battles during World War I, the town was left in ruins by the conclusion of the war. The most famous of these is the Battle of Passchendaele. Soldiers from Canada, Britain, Australia, New Zealand, and other nations combined forces against German troops, engaging in brutal trench warfare that resulted in 750,000 lives lost. Reconstructed after the war, several Ypres landmarks were restored to their original likeness. One of these structures, the Cloth Hall, is located in the centre of the town and houses the In Flanders Fields war museum. The original Cloth Hall was one of the largest buildings of the Middle Ages, having been constructed in the 1300's for the unsurprising purpose of storing cloth. The museum had a closing time of six o'clock in the summer months. I arrived a little after five, but was denied entry since it takes at least an hour to see in detail. My friend Bart, who was showing me around Belgium, tried to explain that I was visiting from Canada but to no avail. We walked to the Menin Gate memorial which arches over a road. The names of 55,000 soldiers who died without graves are inscribed upon it. Its Hall of Memory, although massive, was not large enough to hold all the names of those who had perished. 35,000 other names were inscribed at the Memorial to the Missing at Tyne Cot Commonwealth War Graves Cemetery. We drove to this solemn place on the outskirts of Ypres. The largest graveyard for soldiers of the Commonwealth anywhere in the world, row after row of white tombstones line the field. The name, rank, and regiment are given when the information is available, but the exact details of many of the men buried beneath the 11,952 graves remains unknown.